KOMPAN Playrounds partners with Generation Rescue to provide play opportunities for children with autism. KOMPAN Playgrounds and Generation Rescue have partnered to create and promote relevant play opportunities for children with autism. KOMPAN believes that every child has the right to play - in their own way. Therefore, KOMPAN is working to create play spaces that cater to the unique play habits and development processes of children with autism. KOMPAN will use Generation Rescue’s knowledge of autism-specific needs to best incorporate playground products such as their industry-leading spinners into autism-focused site designs to create spaces for children with and without autism to play – in their own way. 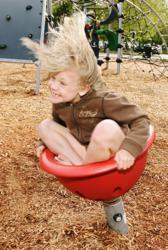 KOMPAN was first inspired to serve the autism community when parents started communicating the benefits to their sensory-seeking children of playing on KOMPAN’s Spinner Bowls, Spicas and other spinning products. whole-heartedly endorse these fun filled play systems,” states Jerry J Kartzinel MDFAAP, Fellow American Academy of Pediatrics. “When we first started hearing from parents of children with autism, we were very pleased that our products could help these children and create a play opportunity that catered to their specific needs. Once we learned that one in 110 children have autism, we realized that we had an opportunity to be part of a much larger picture and do our part to help respond to this growing epidemic by helping these children play and thrive,” says Kerrin Smith, President of KOMPAN, Inc. Together, KOMPAN and Generation Rescue will make relevant outdoor play a reality for children with autism, whether it is at their school, therapy center or in their own backyard. KOMPAN, Inc. is a world leader in the design, manufacturing and marketing of innovative commercial playgrounds and outdoor recreation equipment. KOMPAN specializes in designing unique, age-appropriate, and high-quality products that combine the most stringent environmental standards and exceptional play value. KOMPAN offers unique and challenging products for every stage of development. For more information about KOMPAN, our products and our environmental leadership please visit our website at http://www.kompan.com. Inspired by the journey of their son, Jamison, JB & Lisa Handley founded Generation Rescue in 2005. When Jenny McCarthy first made public her own experience with her son’s diagnosis and subsequent recovery from autism, her unique ability to articulate the unspoken words of thousands of mothers and fathers across the world was recognized immediately. In 2008, she proudly became President of Generation Rescue.